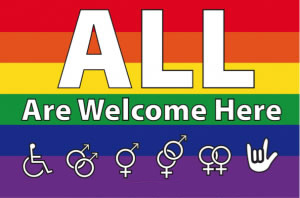 Welcome to Unitarian Universalism, a religion that celebrates diversity of beliefs and is guided by seven principles. Our congregations are places where we gather to nurture our spirits and put our faith into action through social justice work in our communities and the wider world. Newcomers are always welcome. There is no formal conversion process, so becoming a Unitarian Universalist is simply a matter of self-identification. Membership is voluntary and does not require renouncing other religious affiliations or practices. 1 | The inherent worth and dignity of every person. 2 | Justice, equity and compassion in human relations. 3 | Acceptance of one another and encouragement to spiritual growth in our congregations. 4 | A free and responsible search for truth and meaning. 5 | The right of conscience and the use of the democratic process within our congregations and in society at large. 6 | The goal of world community with peace, liberty, and justice for all. 7 | Respect for the interdependent web of all existence of which we are a part. Sunday Services follow a certain format, although from time to time we do try something different, like services in the round or a forum format. These we carry in our hearts until we are together again. Our Religious Exploration program for children emphasizes the open search for truth and meaning that we value as Unitarian Universalists. We want our children to embrace and celebrate the mysteries of the world around us. Our weekly time together incorporates some of the ritual we have in the larger worship services; a chalice lighting, a time of silent meditation and a time for sharing of joys and concerns. Additionally, story telling and craft projects are usually included in our time together. Rev. 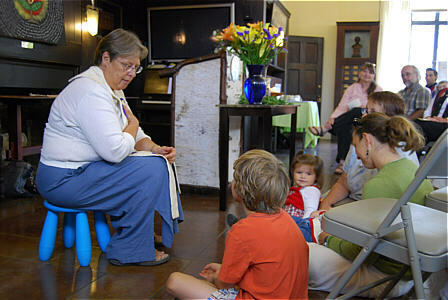 Jane Dwinell talks to the children as a part of her installation service explaining her role in the ministry within the Adirondack UU Community.